Nice mix of youth and experience. A tight five of: Lloyd, Tessman, Longbottom, Thrush & Power should give the team front-foot ball. A back row of: Stowers, Tizzano & Stander - looks like the NRC back-row who were a stand-out in that comp. Halves: Fines & Alatimu given a chance to see how they go from the start rather than coming off the bench. Back-line: Lacey, Uyen, Jooste - plenty of speed and local talent there. The forwards coming off the bench (Kaitu'u, Heiberg, Sheminant, Bardoul, Ferris) aren't a drop-off in ability. It’s all about the kids this Friday at the Force Field. Bring your kids for FREE to a night of entertainment, rides and so much more and watch some of WA’s most talented emerging players take on the Asia Pacific Dragons. 6.10pm – Gates Open – Family-friendly activities are all over Gate 1! Gate 1 will be party central for all the kids this Friday! From a Ninja Warrior Course, animal farm, a big Ferris wheel and an array of arts and crafts there will be something for every child (or adult)! It’s full of family-friendly entertainment and is set to be the greatest start of the school holidays a kid can have! Plus a very spectacular and dangerous display by fire performers! The best and only way to watch this game is LIVE at the Force Field – HBF Park. This game will not be broadcast. An action-packed highlights package will be available after the game. Good news Sea of Blue your member packs have arrived and can be collected at this Friday night’s game from INSIDE the Members Marquee. The Member Marquee is located in the South East corner of HBF Park (next to Gate 4) and is open from 6.10pm through to 30 minutes post game. Please remember to bring your redemption voucher to ensure you can collect your member pack on the night! Member packs will also be available for collection from the Western Force team store (203 Underwood Avenue Floreat) from Monday April 15th onwards between 9am and 5pm, Monday to Friday. Anyone catch that little bit. Apparently the game wont be broadcast? Does this mean no streaming too? Very strange..
Isn’t this game being broadcast? It clearly says the game will not be broadcast which is a massive U turn about what is being promoted. Where is Nick Marvin when you need him? Dont you love how we werent allowed to have the game played at the same time as Super Rugby apparently yet the game isnt even broadcast on Foxsports. SBS are showing a replay of the Force vs South China Tigers at 11:30pm. Looks like there wont be a broadcast despite pandering to RugbyAustralia and the East Coasts demands..
Last edited by Sheikh; 11-04-19 at 16:21. Reason: not reading the SBS TV guide properly! 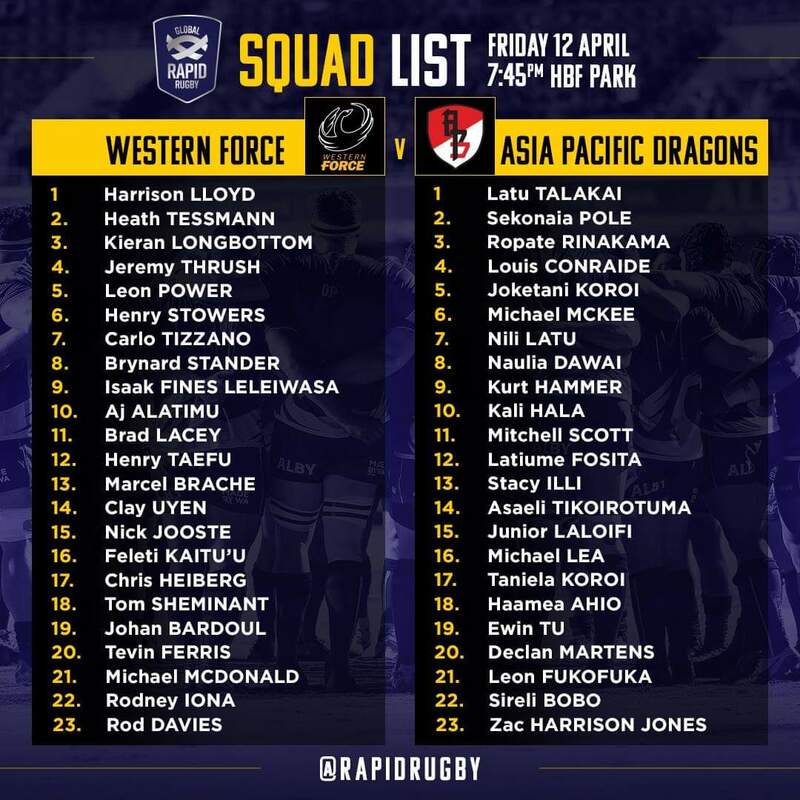 SINGAPORE - The Asia Pacific Dragons, a professional rugby team based in Singapore, will make their debuts in the Global Rapid Rugby Showcase by taking on Australian side Western Force in Perth on Friday (April 12). The Dragons' squad features internationals from New Zealand, Australia and South Africa while head coach Ryan Martin has included Singapore international Declan Martens in his 23-member roster for the clash at the HBF Stadium. Martens, a 26-year-old lock, said: "To be selected to play alongside some of the biggest names and seasoned professionals is a dream and I am extremely honoured to represent the Singapore Rugby Union and my club, SCC (Singapore Cricket Club) tomorrow night." The Dragons then face South China Tigers in Hong Kong on April 21 before returning to Singapore for home games at Queenstown Stadium against the Tigers (April 28) and Western Force (May 5). The Global Rapid Rugby is the brainchild of Perth billionaire Andrew Forrest, an avid supporter of Western Force. The franchise, along with two weaker South African teams, were culled from Super Rugby after the 2017 season to streamline and balance the league. The tournament features sides from Fiji, Samoa, Hong Kong, Australia and Singapore and is aiming to expand into markets like New Zealand and Japan next year. There is a A$1 million (S$970,000) purse for finishing first. The rules are slightly different from the traditional version of rugby. Instead of the usual 80 minutes, matches are reduced to 70 minutes. There is also a "power try" - for when a team scores from a move that starts inside its own 22m line - that is wroth nine points. Under conventional rules, a try is five points with a chance for a two-point conversion, for a total of seven points. Penalty goals in Global Rapid Rugby will count for two points instead of three. Great game again and a great night out. I really don't think the score really reflected how well the APDs played. We really need a 60 second clock for scrums on the screen to get the game flowing, there were just too many scrum resets last night. Well done to Carlo Tizzano, thought he had a great debut.